It’s fashion month. That means the top designers are revealing the trends for Fall 2015 at Fashion Weeks worldwide, including the big ones in London, Paris, Milan and New York. 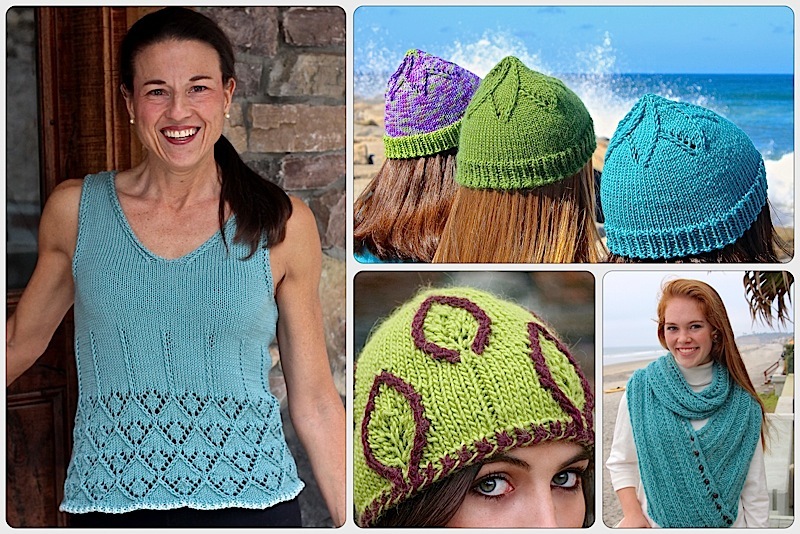 The amazing thing this year is that so many of the trends are perfectly suited for hand knitting. It’s as if they had us in mind. 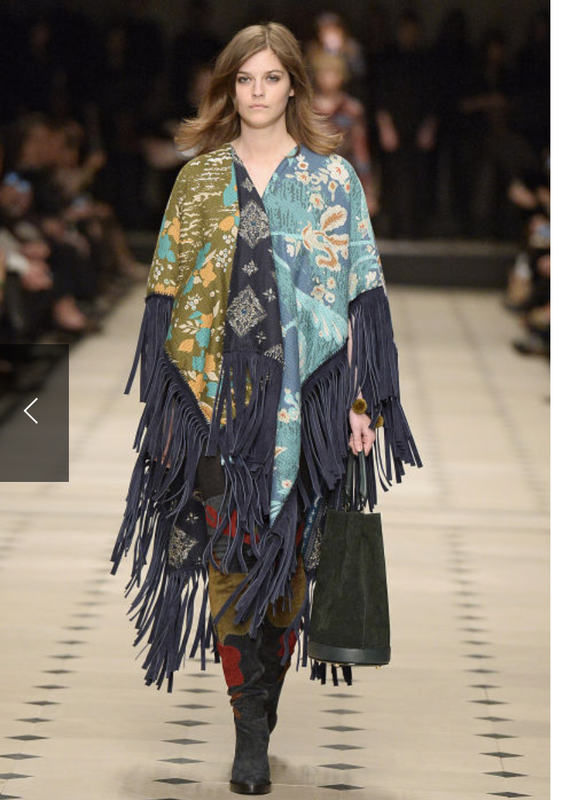 This is just one of several ponchos mentioned in the Elle Fashion Trend Report. 7. And the one I never saw coming … the brooch. Yes, really, and as you will see in the photos, they are elaborate. Start dressing up your scarf pins because we knitters already had this one dialed in. There were so many inspirational photos that we added a new Board on our Pinterest page. We’ve had hints that ponchos were coming back, although I’m not quite sure when they went away after their huge resurgence 10 years ago. Just check out the Tommy Bahama store and you’ll see tons of them. My new poncho design is about 60% knit so I’m really happy to see I haven’t been doing all this knitting for nothing. Looks like I’ll have to add some fringe. I’m thinking mohair fringe would add some real drama and not be too weighty. I love knitting with this Blue Sky Alpaca Silk (Ice #113) I bought last fall on one of my stash building trips to Jimmy Beans Wool in Reno. It’s light to knit with and results in a lovely knit fabric with a nice drape. Since I didn’t wet block my swatch (say what?! ), I gave it a good steam block after the first skein to see how much it will stretch. A side benefit is I can see how nicely the yarn shows the stitch pattern. 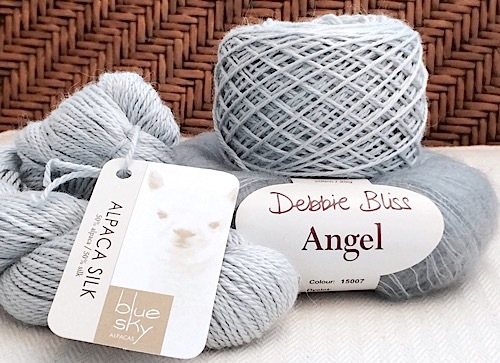 I’ll be pairing it with this Debbie Bliss Angel (Silver #07) to create a fabulous fringe that will make you feel like you’re walking the runway. This yarn was not in my stash, but somehow between yesterday afternoon when I wrote the previous paragraph and this morning, it simply appeared. The Yarn Genie strikes again. One trend I’m not so happy to see, puffy winter jackets are getting puffier this year. Sorry, but they were ugly, but necessary in the 70’s, not so necessary now. Guess I’ll just hang here in San Diego and avoid them! How do you feel about ponchos and puffy jackets? Ponchos and anything “puffy” would not work on my already-plus-size frame. Rather,I tend towards keeping with the classics-for Fall/Winter seasonal wear,especially since more cost goes into quality items during cooler weather. This entry was posted on March 4, 2015 by Laura Cunitz in General, Yarn & Yarn Shops and tagged Blue Sky Alpaca, Debbie Bliss Angel, Knitting Trends.